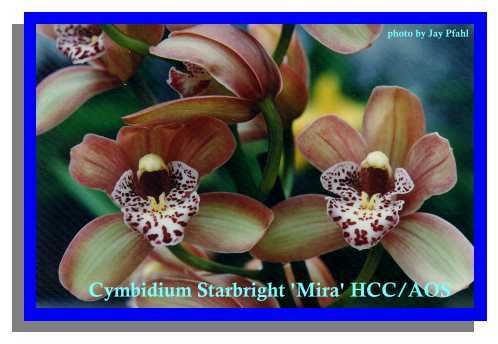 Cymbidium Alliance This group is called the subtribe Cyrtopodinae, one of 4 that comprise the Tribe Cymbidieae. 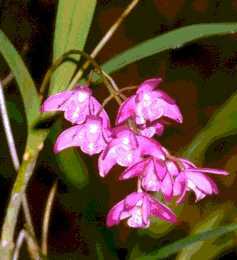 It includes the genera listed, Ansellia, Bromheadia, Cymbidiella, Cymbidium,Cyrtopodium, Dipodium, Eriopsis, Eulophia, Eulophiella, Geleandra, Geodorum, Grammangis, Grammatophyllum, Graphorkis, Grobya, Oeceoclades, and Porphyroglottis. 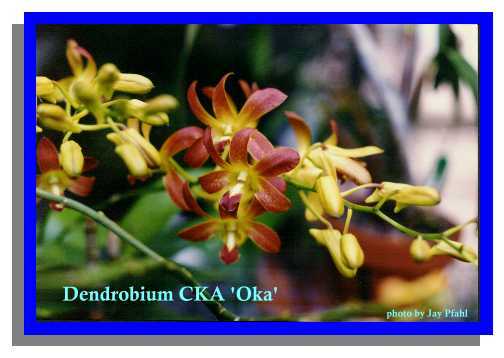 This is a warm growing Cymbidium and I have repeatedly bloomed it in Key West where it is hot. 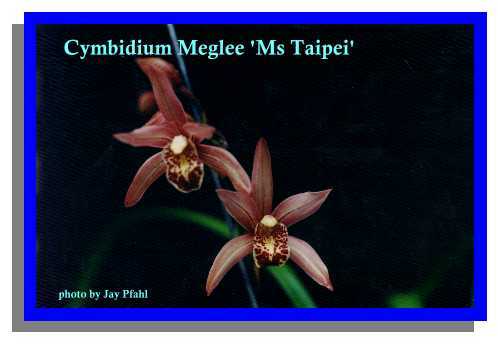 The parents of this plant are Cymbidium ensifolium and Enid Haupt and it was registered by Rod McLellan in 1978. 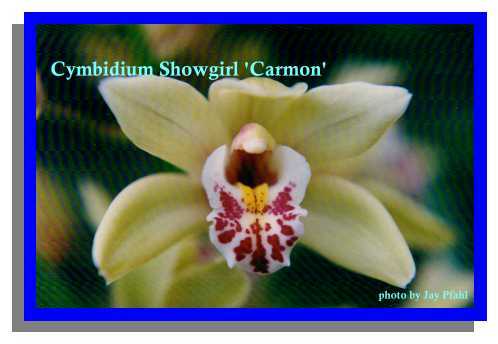 This is another garaunteed warm blooming Cymbidium as I have bloomed it 3-4 times a year for 3 years. 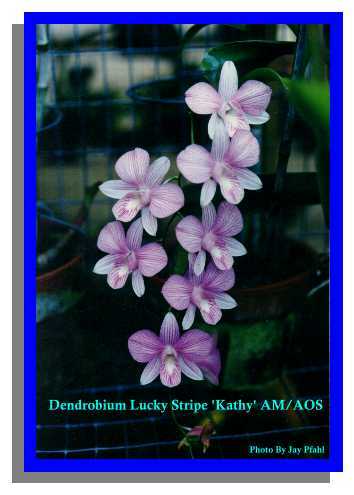 Cymbidiums Sweetheart and Alexanderi make up this plant registered in 1962 by Baker. 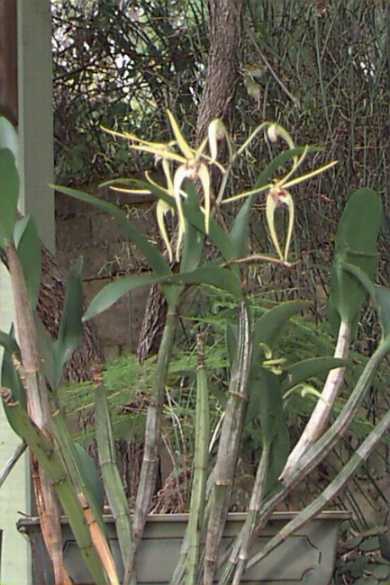 This cross is a bit more difficult to bloom in a hot climate, mine has only bloomed 3 times in 7 years. Cymbidiums Pumilum and Lyoth make up this hybrid registered in 1964 by Greenoaks. 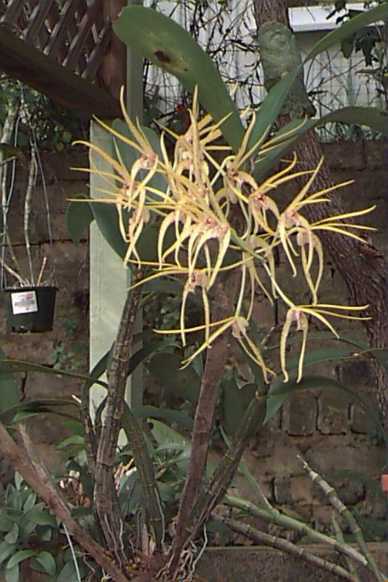 Grammatophylum This natural genus has about 12 species interspersed through SE Asia, Philippines, Indonesia, and the SW Pacific that have large pseudobulbs and leaves with a long inflorescence that arises from the base of ther pseudobulb and carries many medium to large showy, long lasting, flowers. These plants require space so plan well. 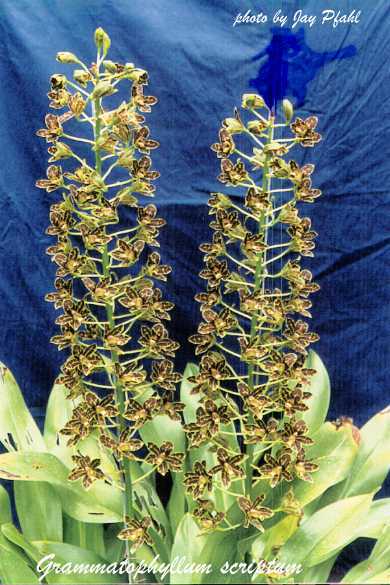 A young plant can have pseudobulbs up to 24" and they multiply rapidly. 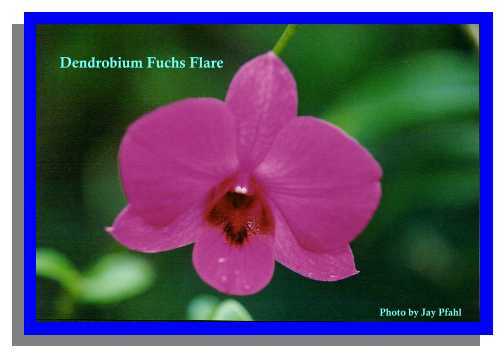 It has been written that the Fredrick Sanders firm in the late 1800's collected a plant off Penang Island in the Malay penisula that weighed one ton. 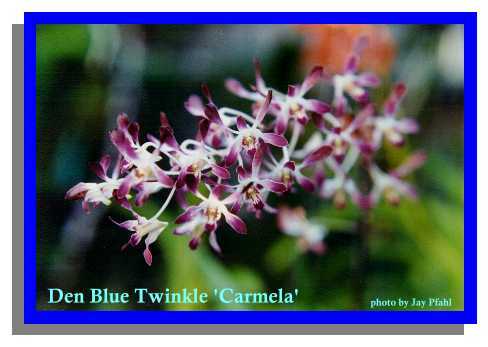 It was so large that it had to be divided so half went to the Columbian Exposition in Chicago and the other half went to the Singapore Botanical Gardens where divisions of it still reside. 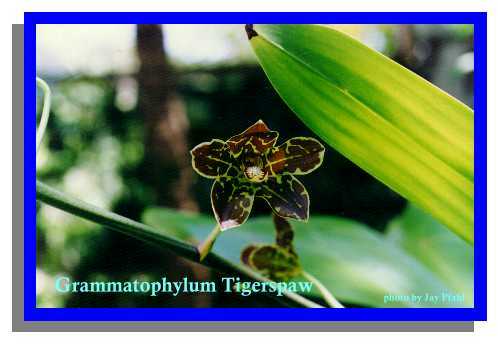 The two grammatophylum species elegans and scriptum are crossed to create this hybrid registered in 1980 by Jones and Scully. 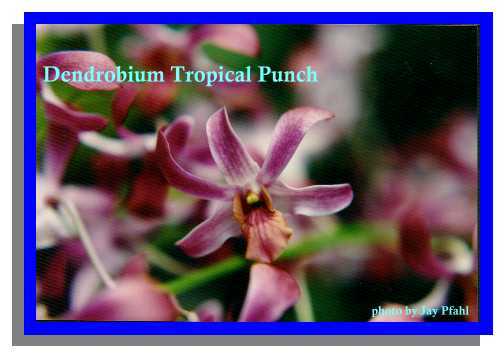 Dendrobium AllianceThe Subtribe Dendrobiinae is one of 6 parts of the Tribe Dendrobieae [Subtribe Thuniinae, Coelogyninae, Glomerinae, Bulbophyllinae, and Sunipiinae make up the other parts] and is composed of Cadetia, Dendrobium, Diplocaulobium, Epigeneium, and Flickingeria. Theoretically all of these genera can be crossed with each other. 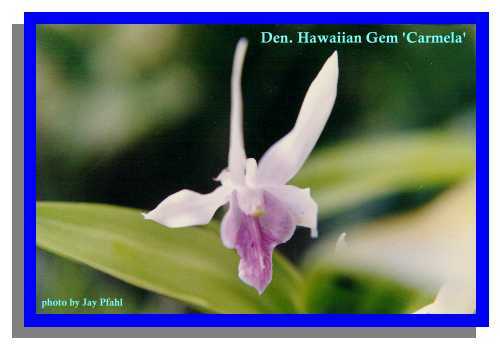 The parts of the Dendrobium flowerare as follows, #1, Dorsal sepal, #2, petal, #3, sepal, #4, labellum, #5, column. 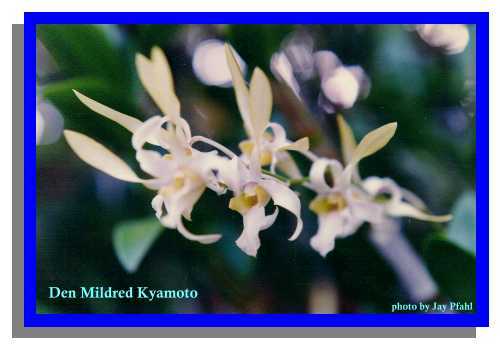 Dendrobium Betty Goto crossed with Dendrobium caniculatum creates this fragrant small multi-flowered beauty. 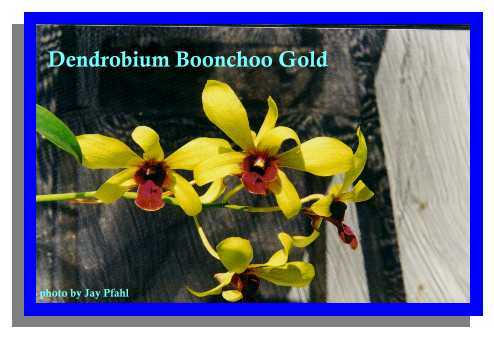 This cross is composed of dendrobium Sri Siam and Hawaiian Gold and was registered by Boonchoo in 1983. 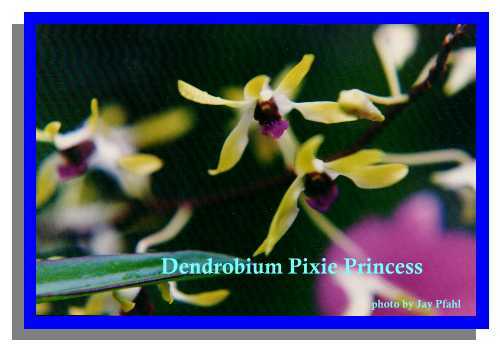 Dendrobium Macrobig crossed with superbiens produces this minature plant registered in 1986 by U. 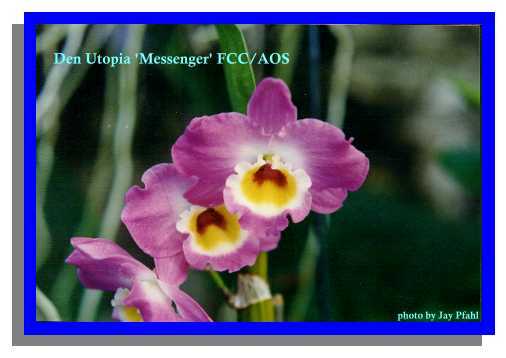 Of H.
This hybrid combines Dendrobium May Neal with Hula Girl and was registered in 1956 by Ai. 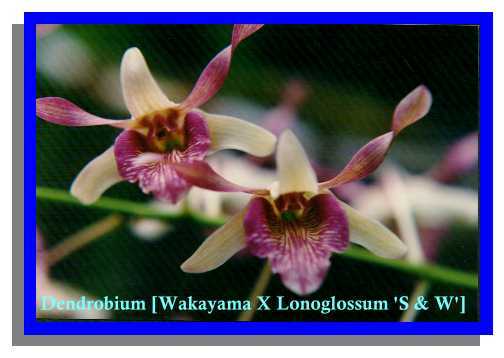 This is a sibling cross with the parents being Dendrobium Ling Suiking and Lady Fay and was registered by Hinchey in 1963. 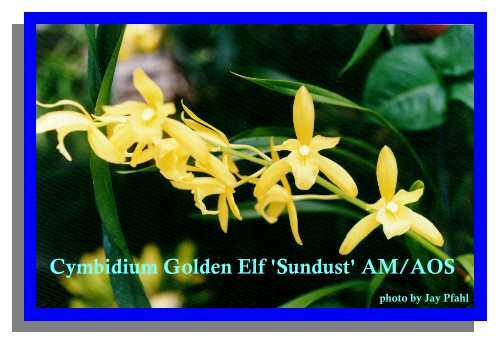 Dendrobium Lowana Nioka and Goldenhill are the parents of this summer to fall bloomer. It was registered by Hongsanyatam in 1983. 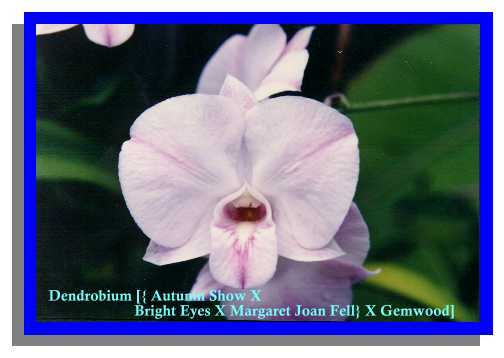 The parents of this cross are Dendrobium Darcie Mikami and Rung Roeng and was registered by RF Orchids in 1985. Photo courtesy of Guy Cantor. 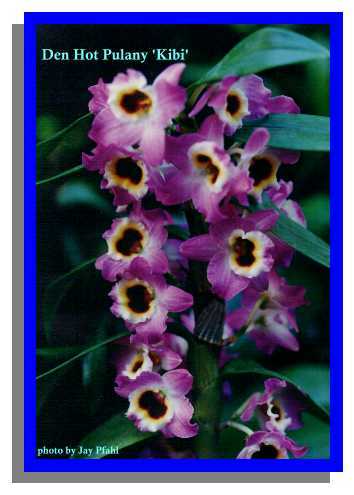 Dendrobium Eureka and Dendrobium Nunkumbil are the parents of this Australian hybrid registered in 1989 by Skillicorn. 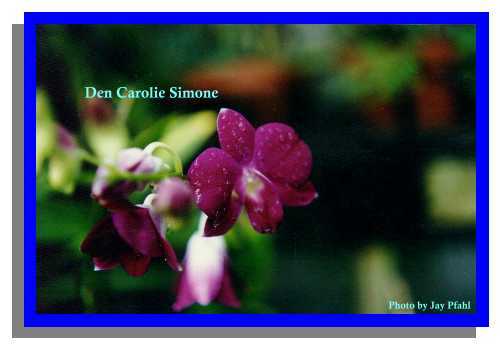 Carmela registered this cross in 1989 made up of Dendrobium Spellbound and dalbertisii. 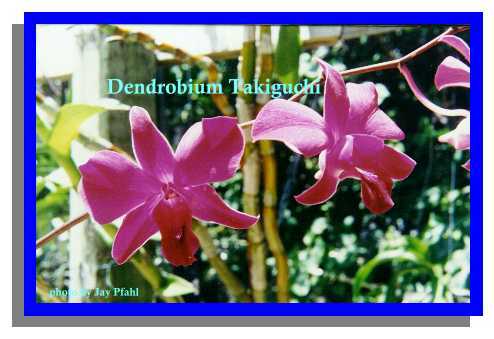 Dendrobium Lekku and Superstar make up this hybrid registered in 1984 by J. Yamamoto. 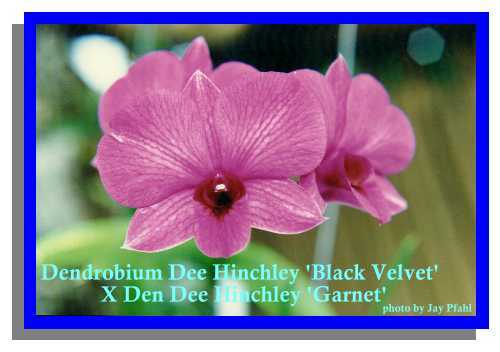 Photo courtesy of Guy Cantor The parents of this Australian hybrid are D. kingianum and D. Bardo Rose and was registered by Butler in 1976. 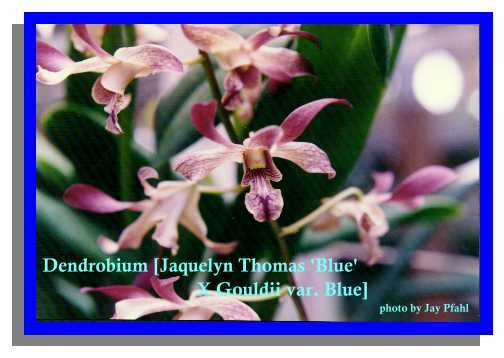 Dendrobium Jaquelyn Thomas 'Blue and Dendrobium gouldii var. Blue make up this 1967 hybrid registered by Sakamoto. 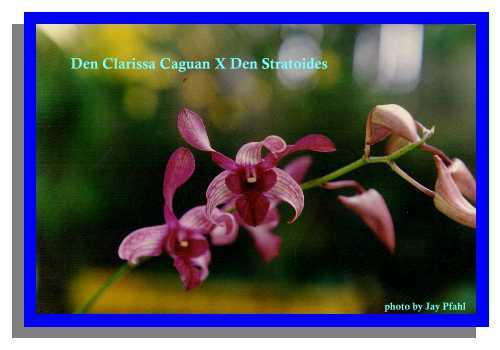 Dendrobiums [ Clarissa Caguan X Stratoides ] create this cute spring and summer bloomer. 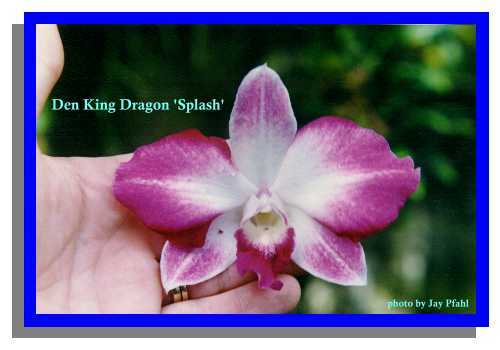 Registered in 1988 by Chusung this plant has Dendrobium Ekapol crossed with Polar Queen. 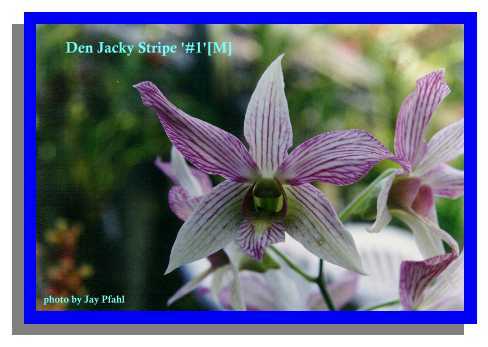 Dendrobium Fujimusume is crossed with Cherry glow to produce this hybrid registered in 1977 by J Yamamoto. 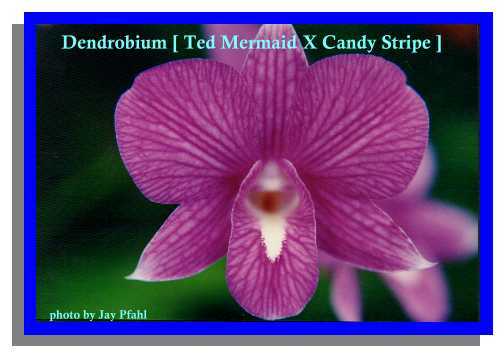 This hybrid is composed of Dendrobium Candy Stripe and Tomie and was registered in 1981 by McFarlane. 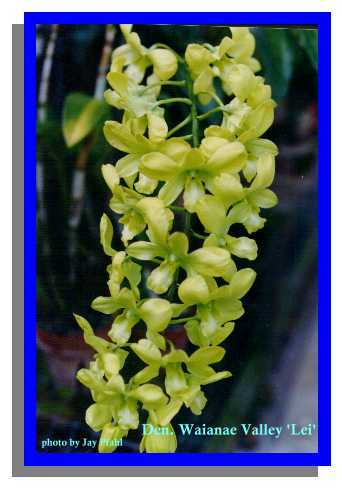 H&R bring us this 1986 registered hybrid with a parentage of Dendrobiums Pixie Nani and canaliculatum. 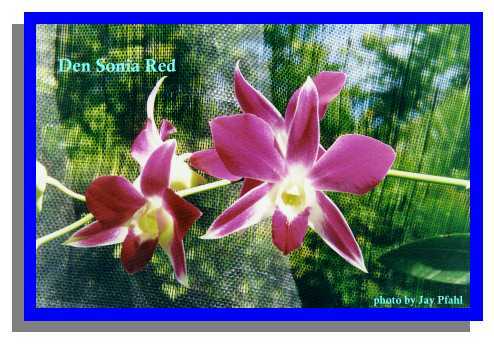 This hybrid is made up of Dendrobiums Keiki Belle and canaliculatum and was registered in 1996 by Hong,Wong Siew. 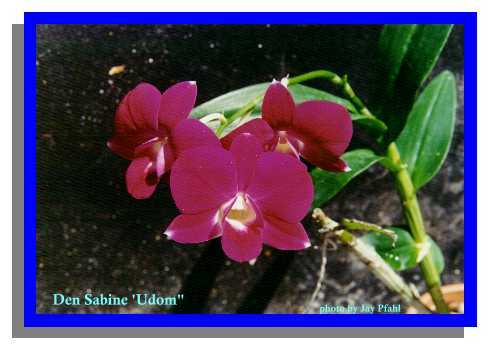 Dendrobiums Ceasar and Tomie Drake are the parents of this cross registered by Bankok Orchids in 1984. 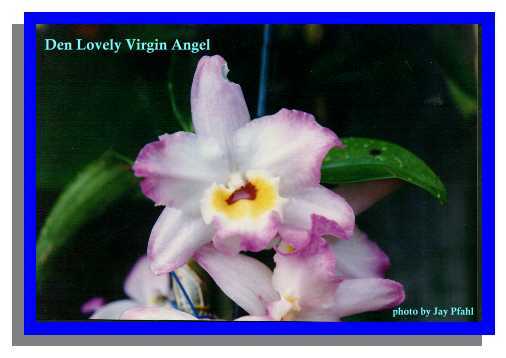 Large outstanding 4" flowers that last for weeks and blooms 3 times a year. 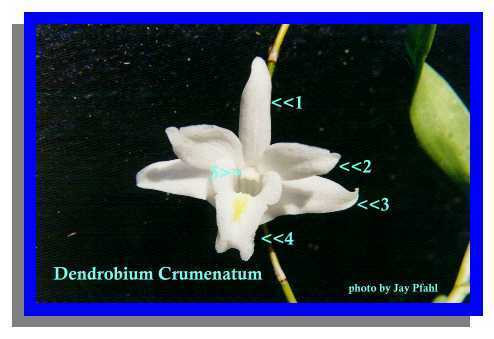 Dendrobiums Norma Jackson and caniculatum make up this cross. 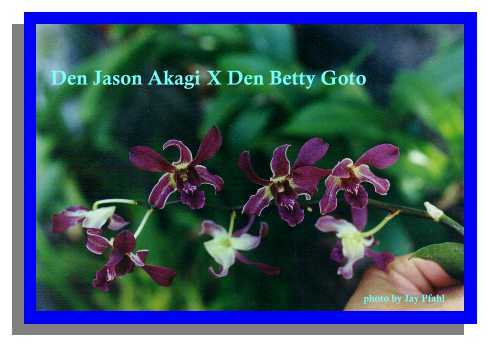 Dendrobium Glorious Rainbow and Orion make up this cross registered in 1971 by J. Yamamoto. Dendrobium Waianae Valley 'Lei' This cross has Dendrobium Alan Umaki and Anching Lubag and was registered in 1985 by Miyamoto. Click Alliances Below to see hybrid photos within that group. The Stanhopea Page A list of all the Stanhopea species and photos of many of the species. Just Click on the Subject Below and the Section of the page will appear.